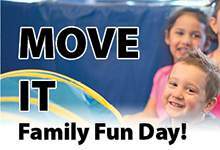 MOVE IT is free to attend and indoor footwear is required. We are accepting donations for the REAL Program that provides children and youth in financial need with recreation and leisure programs of their choice. National Child Day is a day to celebrate the rights of children everywhere to live happy, healthy lives, and to ensure they reach their full potential.